Exclusive / A week after the landmark State of the Union speech by European Commission President Jean-Claude Juncker, the first president of the European Council Herman Van Rompuy told EURACTIV.com that merging the two functions at the EU helm could run into legal and political obstacles. Herman Van Rompuy is former president of the European Council and the first to assume that position with the entry into force of the Lisbon Treaty. He held the presidency from 2009 until 2014. He is currently president of the Brussels-based think tank, the European Policy Centre (EPC). 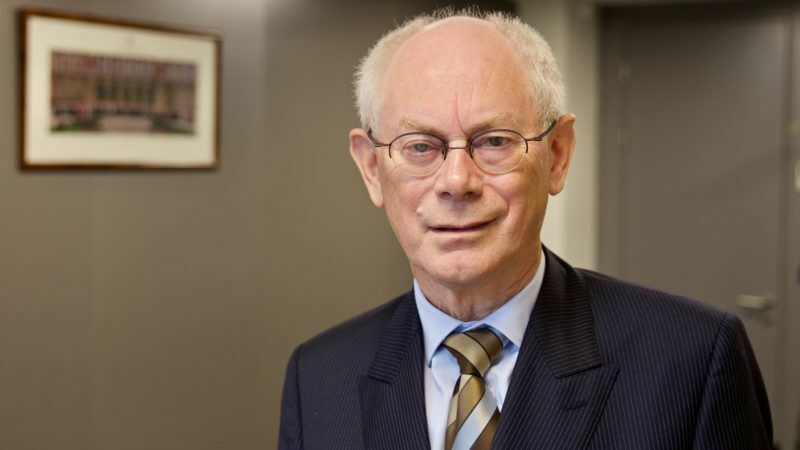 Van Rompuy spoke to EURACTIV’s editor-in-chief Daniela Vincenti. Mr. President, as you know President Juncker last week delivered his State of the Union address. What did you think of the speech? I was happy. The Commission finally switched from reflection papers to position taking. In the last months, it was all about scenarios, and the Commission relied on the member states to make their choice. There’s an expression in Brussels: La Commission propose, les états membres disposent (The Commission proposes, but member states have the final say). I think the Commission has to do more, especially a Commission that calls itself a political Commission, so I’m happy that they made proposals. In this sense, it’s a real contribution to the big debate we will have in the course of 2018 together with the French-German initiatives and the ideas of the Commission that are now on the table. Everybody has to take a position regarding their proposals. Juncker focused on a number of institutional changes. He proposed merging the president of the European Commission with the president of the European Council. You were the first president of the European Council after the adoption of the Lisbon Treaty. Is it desirable to have a single president? My first reaction was: “Let’s focus on the content, and not so much on procedures, institutions.” In Europe, when you have no solution on substance, then you create a new job or you invent a new institution. That’s the reason I was sceptical, it sounded too much Brussels-like. The rest of Europe’s 500 million citizens are not so much concerned by a merger of a commission or council presidents. My second reaction was that it creates more problems than solutions. The European Union is some kind of mixture of what we call in our language community method and intergovernmental method: the tension between the European interest and the member states’ interests. The Commission is there in the leading role to defend the European interest. And then you have all these national interests of course. The European Council tries to find a European solution starting from national interests. So the Union has that kind of balance. If you change that balance, you create more problems than solutions. Fourth, now we have the Spitzenkandidaten. I was not always happy with the process, but we all accepted it and most likely we will have Spitzenkandidaten also for the upcoming elections [in 2019]. I don’t think it’s true, but it’s considered as some kind of power grab of the European Parliament. There is the perception that the European Council has lost the leading role in appointing the president of the European Commission. Again it is not completely true but that’s a perception. If now the president of the Commission becomes the president of the Council, the heads of state and government will have the impression that they have no role to play anymore in the designation of their own president. They already had to accept a president of the Commission, the candidate so to speak of the parliament and now the chairman of their own meeting is imposed also indirectly by the Parliament. There will be strong resistance. I cannot imagine that this idea of merging the two functions will we be accepted by unanimity. There are also legal problems because the president of the European Council has only a two-and-a-half year mandate, renewable once, the president of the Commission has a five-year mandate and it is renewable. But he can stay a third term if he gets a sufficient majority in in the Parliament. You can do it apparently within the treaties. Still, there are legal obstacles. But my last argument against the idea is that you create a single function with one person embodying the European Union. But if he sticks to the current competencies that the president of the Commission the president of European Council have, then you are raising expectations, and with the current competencies, you cannot deliver. So, I think it will end up in disappointment, democratic disappointment. We have to be very careful because there is already a malaise in our societies. Juncker mentioned transnational lists, he mentioned new rules on the financing of political parties to give them the means to fight populist pressure. Should we still be afraid of populists and is now the right time to do all this? I think you have to fight populism primarily on the national level. But I don’t think that by creating a new function you will be a populist. And on the contrary, it could be that raising expectations without any possibility of delivering even enhances populist feelings. You have to beat populism with policies. Strengthening the Schengen zone, avoiding massive illegal migration, promoting legal migration instead; harnessing growth and jobs, and more stable jobs. Giving much more security to people in effectively combating terrorism, these are the main concerns. And institutions and people are not a substitute for policies. I think you need to really change the treaties for this. Of course, the time is too short to change the rules before the elections of 2019. But in principle, I always found it a good idea. The populists will say we should make savings by doing without those 73 UK MEPs. But I think this pan-European list will give a very strong signal that the European Parliament, at least in its composition, also reflects the European interest because the people are elected from a pan-European list. It is a good idea, but you will not have it in 2019. A European minister for economy and finance “to promote structural reform in our member states”— basically to transform a Moscovici into a vice-president and make him a minister who would preside the Eurogroup. It makes sense, doesn’t it? This is not new, it is an old idea. But here also there is some kind of repartition of the roles, which in my view it has to be respected. The economy and finance Commissioner is responsible for launching sanctions procedures and monitoring stability and growth or the macroeconomic imbalance procedures. And so he has to be really independent. When he also becomes minister of finance, he will become double-hatted. There could be conflicting competencies and interests. I have never been in favour of mixing competencies. When there is not enough clarity it leads to confusion. And again, you think that you are providing solutions, but it could be that you are also creating more problems. It’s simplistic to think that you provide solutions to problems with the simplification of procedures or institutions. When everybody is in their role working together it can work. To come back to the president of the Commission and the European Council, I worked with the president of the European Commission at the time, I would not say in harmony, but it went well. And apparently, President Juncker has a very close relationship with President Tusk: all the better. So it depends really on persons, working together seeking the common European interest but respecting the competencies of each of them enshrined, by the way, in the treaties. The proposal of using the passerelle clause (move from unanimity to QMV provided that all heads of state and governments agree) in matters of taxation and foreign policy is indeed bold. Isn’t it? But with your experience of leading member states, can it really happen? In general, going from unanimity to qualified majority is a good evolution. But you always have to find a major majority for this decision to use the passerelle. Even after Brexit, leaving the rule of unanimity in foreign policy will be extremely difficult. And the same applies to taxation. There are at least two schools of thought in the EU: those who support tax competition and those who support tax harmonisation. So I don’t think that we are ready to use this passerelle. Intellectually speaking as a European, I would, of course, welcome more votes with qualified majority than unanimity. Just one footnote: if on foreign policy you put a group of countries or one of the most important countries in a minority position, I’m not sure it will work. QMV is not simply a mathematical process, where you count the votes and the decision is taken. The aim should always be to get everybody on board. I had a difficult exercise in foreign policy when we adopted sanctions on Russia. It was a difficult exercise. But after a few months, we got a unanimous decision, we succeeded and they are still in place. In the Ukrainian case, it was about war and peace, but there were also a lot of economic and other interests at stake. And we succeeded in getting a unanimous decision on a highly sensitive topic. So you can go ahead with unanimity but it takes longer. However, if you put a group of countries or a big country in a minority position on a vital issue, then you’re looking for problems. You mentioned the Brits. Now Mrs May is going to give her speech in Florence. Why do you think she chose Florence? Mrs Thatcher chose Bruges. David Cameron for his speech chose Bloomberg in London, but his first choice was I think Amsterdam, it was in the Netherlands and then he had to cancel. So it is not really new for a British Prime Minister to deliver a major speech on Europe outside Britain and on the continent. But I am surprised it took so long. You have always been sceptical about the British readiness to find a compromise on the terms of divorce (made on citizen’s rights, the Irish border and the controversial ‘exit bill’) rapidly enough to start trade negotiations. Juncker barely spoke about Brexit. Do you think we have entered Brexit fatigue? In the Brexit negotiations, for sure after the elections, there is a growing awareness that a unilateral withdrawal is a catastrophe, in the first place for the UK. It will create problems for the 27 but is a catastrophe for the UK. And secondly, even if we started negotiations on a free trade agreement in October – which will not happen, but let’s assume that we start in October – you will not have finished by the end of 2018. So you need a transition. And not as previously thought by the British government as some kind of implementation period for an agreement that is already negotiated. You need a passerelle, you need to bridge the period between the time of Brexit and the new FTA. And that takes years as everybody knows. So you need a transition. I think there is now an understanding that it is absolutely needed but there is growing awareness that there is only one possibility, and that is that is that you have to stay in the single market and the customs union because you will have no time to negotiate a special deal on a transition. It will be as difficult as negotiating a free trade agreement. So I will not say you take it or leave it, but when you say that you need a transition there are not 20 possibilities: in my view, there is only one. You can negotiate some modalities on sensitive issues but all in all it will be extremely close to the membership of the single market and of the customs union. We’re heading for elections in Germany this week. We know likely what’s going to happen. Chancellor Merkel will probably get a new mandate. What do you expect from the Macron-Merkel relationship? Today, we are in a totally different situation than a year ago and we can speak about French-German relations if you’re willing. But we should never forget the past, even the recent past. The climate has changed dramatically in Europe. The problems are not solved but we did get this decisive victory over populism. And I’m sure even in Italy that there is still a huge majority of people that want to stay in the European Union and in the eurozone. Even populist parties are aware of this – never forget that a populist party wants to become or to remain popular. To some extent membership of the European Union and membership of the eurozone is still popular. That does not mean that there is a Euro-enthusiasm. But leaving the eurozone and the EU is not on the agenda of a majority of Italians. My second point is that to relaunch the European idea – not to reinvent Europe, for that you need an overhaul of the European structures and you need treaty change – to re-energise Europe, giving it new ambition and objectives, new targets, France and Germany can do the job. They did it in the past and I believe they can do it in the future. My sub-question is: who else? Of course, the European Commission can put ideas on the table, which they have done via their reflection papers and via the State of the Union speech. But as I said: La Commission propose, les états membres disposent. Among member states, France and Germany are still in the driving seat. Why? Because especially in socio-economic matters Germany represents the key value of responsibility and France represents the other key value: solidarity. There will always be a balance between responsibility and solidarity, even beyond socio-economic matters on social-cultural matters like asylum, migration, identity… it’s all about responsibility and solidarity. But other countries could also make proposals for relaunching the European project. The composition of Benelux is also a composition in which you can find people who are more concerned by solidarity and others more by responsibility, but they lacked the energy to do it. And the Scandinavian countries or the Baltic countries, they could also take initiatives. Now you’re in a situation where France and Germany are prepared to do something, and a lot of countries are saying they do not have a monopoly on launching a project. But if they don’t do it, who else will? So you would be in favour of groups of other countries coming up with a vision? In a positive way, not in the way of a group of countries saying no to Europe. In a constructive way, it could be a major contribution to the debate. And then you get rid of this feeling that France and Germany again are dictating their will. I think in any case they would play a major role. But others can make contributions, balanced contributions. If you had to give the State of the Union what would be your proposals? First of all, I am now a spectator of European and Belgian politics, an engaged spectator, but a spectator, as I have no temptation at all to be in the place of those who have the responsibility today. I know how difficult the job is. But what I miss to some extent is what we call – and I don’t like the word, but I use it because I know no better word – the ‘narrative’. You can have some kind of enumeration of a lot of proposals linked to institutions, to procedures, policies. But we have to convince European citizens that Europe is at their service. Listening to them and making Europe a better place to live. My general approach is the following: how can we reconcile open societies, open democracies open economies, which is a great achievement of the European Union, and the need for more protection? Some don’t like the word protection. It comes from François Mitterrand. But how can we give them more protection against unemployment, insecure jobs, massive illegal migration, terrorism, climate change, tax dumping, social dumping, commercial dumping – you name it. How can we find this new balance between openness and protection? We can find it. Just as we found a social market economy after the collapse of capitalism in the 1930s and found a balance between market economy and social protection. We need more now, we need something different. The world has changed completely and Europe is part of the global economy, which was not the case when we invented the social market economy because that was a national concern. Now we need a Europe-wide concept. It’s not only a European problem. You see in the United States exactly the same problem. And when you don’t give sufficient protection to people, then people are tempted to switch to protectionism. In a way, you need to find balance between space and place. Space is the openness of our economy, democracy and society and place means a place that protects you against negative threatening evolutions. You can call it the balance between the movers and the stayers-at-home, a balance between those who are living in the in the global world, cosmopolites, and those who belong to somewhere specific. If you are too much attached to somewhere, then you are rapidly anxious, the other is always the enemy. Your scope is very restricted. And when you don’t belong to anywhere you don’t feel solidarity with those who are afraid of this new world. So what I missed in [Juncker’s] speech, and it is not a reproach, is some kind of narrative. To go to European citizens and tell them: we understand you and we are working in that kind of direction. Of course, this means a rethinking of the eurozone, this means a strengthening of the Schengen zone, it means that you have to work on European defence on common instruments to combat terrorism. And the Commission has made very concrete proposals. Of course, you need concrete ideas and concrete proposals, but then you put them in a framework. So that you can see in what kind of direction the European Union and European leaders are moving. The storytelling is needed.